The Arizona Cardinals are ranked as the third oldest team in the NFL. They also have the oldest backups in the league on the offensive line. Since starting the season off at 1-6, the Cardinals coaching staff has decided to utilize some of their younger talent in larger roles. Injuries have also plagued the team, but in some instances, it has actually allowed younger players more opportunity. The offense seems to be controlling the ball better, and there are signs that they are improving as a unit. Overall, the team has won three of their last four games. 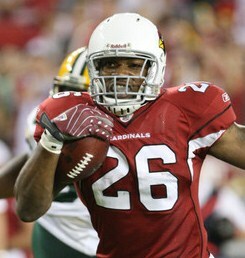 Offensively, the Cardinals drafted a running back, tight end, fullback, and wide receiver in the 2011 NFL Draft. Almost every one of these picks has already been productive in their first NFL season, which bodes well for the Cardinals future. In addition to the new draft picks, the Cardinals have several other young players who are getting their opportunity to shine. Ryan Williams showed a lot of promise until he suffered a season ending injury in the second preseason game on August 19. He saw limited game time, but was averaging 5.4 yards a carry, and the coaches were very high on him. His injury has allowed Beanie Wells to step up and show his worth. Although he has suffered some minor injuries this season, Wells currently has rushed for a career high 849 yards, averaging 4.7 yards per carry, and eight touchdowns. He also rushed for a franchise record 228 yards on Nov. 27. Wells turned 23 this year, and Williams is only 21. The running back position for the Cardinals should be stable for many years to come. Tight end Robert Housler has potential, especially as a receiving tight end. He has great speed for his size, and very good hands. Housler would have seen a lot more game time this season had the Cardinals not acquired Todd Heap after the draft, and he had not suffered a groin injury that has hampered him the last four weeks. Housler had five receptions for 68 yards in a preseason game, and at 23, looks to be the tight end of the future for the Cardinals. Look for Housler to see more action throughout the remainder of the season. Heap is 31, and will be a good mentor for Housler. Rookie fullback Anthony Sherman was so impressive at camp that he started the first game of the season. He will be a great lead blocker, and can help in passing situations. He had a small setback with an ankle injury early in November that took him out for several weeks. Reagan Maui’a replaced Sherman over the last three games, but was released recently, now that Sherman is healthy again. Sherman will turn 23 in a few days, and as a replacement for 27-year-old Maui’a, should be a staple as the blocking back for the Cardinals for several years. The last offensive draft pick was wide receiver DeMarco Sampson. He still needs to prove he is an NFL caliber receiver. He currently is behind Larry Fitzgerald on the depth chart. His positives are his size, good hands, and body control to catch balls in the air. He may not have the separation speed to make him a number one or two receiver in the NFL. Andre Roberts is another young receiver. 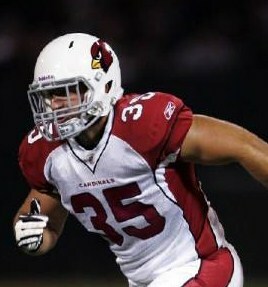 He is only in his second year in the NFL, but has been the Cardinals starter all season, opposite Fitzgerald. He has good hands, but lacks size, and is not a good run blocker. He has good speed, but not the type of speed to separate from defensive backs. Both Sampson and Roberts need to step up their games if they plan on being the future of the Cardinals receiving corps. Sampson will soon be 26, while Roberts is almost 24. 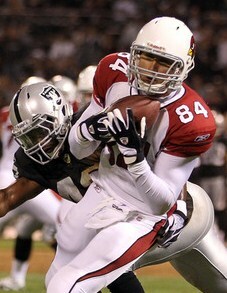 Fitzgerald, at 28, recently signed an eight year contract with the Cardinals, and is one of the NFL’s elite receivers. Fitz has 51 receptions for 888 yards, well on his way to his sixth 1,000 yard receiving season. 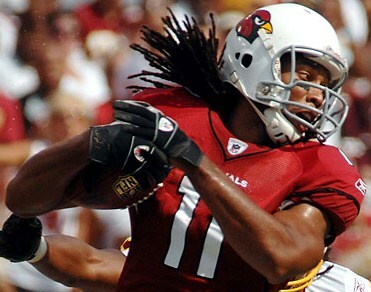 The Cardinals will need another receiver to step up as a solid number two, to add to the threat in the passing game. The Cardinals just need to find their future quarterback (possibly Kolb at 27 years old), and improve the offensive line, especially in pass blocking. If they can do these two things, the Cardinals should have a successful offense for at least the next five to eight years. ~ by Troy Erickson Realtor on November 30, 2011.